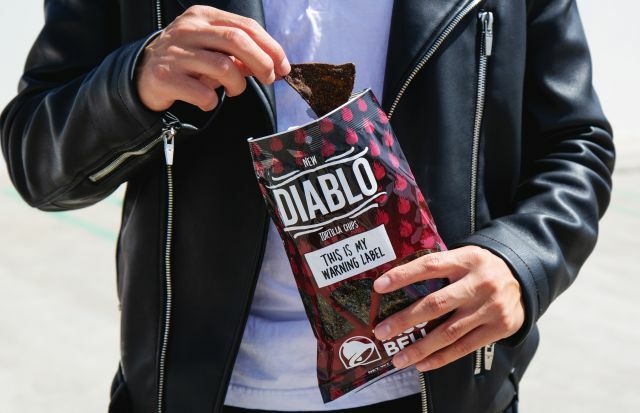 Taco Bell's line of packaged tortilla chips gets its first limited-edition flavor with the arrival of new Diablo Tortilla Chips. The new variety of chips is exclusively available at participating 7-Eleven stores through the end of October, at which time if will roll-out to other grocery and convenience stores through November. To set the chips apart from the typical spicy red chips, Diablo Tortilla Chips are colored black with vegetable juice. Their flavor is described as "a kick of hot peppers and a hint of lime." Like the rest of Taco Bell's tortilla chip line, the new chips are vegan, kosher, and gluten-free. Additionally, they come in 3.5-oz bags that resemble the sauce packets from which the flavor is inspired.